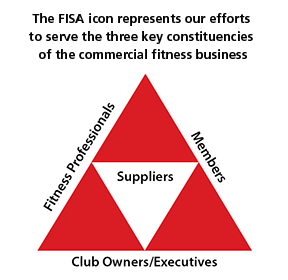 The Fitness Industry Suppliers Association of North America is a 501(c) 3 non-profit organization. We provide market intelligence and unique events that enable our members to better understand the commercial sector and meet the needs of commercial facilities and their customers. FISA N.A. was founded in 2000 when a small group of manufacturers agreed to work together to improve business relationships with their customers and each other. Suppliers of all sizes participate. They include manufacturers of traditional exercise and functional training equipment, software products, EFT service companies, providers of capital equipment, support services such as marketing, personal training software, testing services and exercise programming. All are welcome to work cooperatively to grow our business. Find out more about how we work together.